Coffee, that delicious brew that starts the day with it's wake up aroma and completes the perfect meal with a gourmet flourish. For a nice change in the morning you might want to try an orange spiced coffee. Use the regular amount coffee but add a teaspoon of fresh, grated orange peel (eat the rest of the orange slices with your breakfast), 1/2 teaspoon cinnamon, 1/4 teaspoon nutmeg and five whole cloves. Add everything together and brew the coffee. Place a slice of orange at the bottom or your cup. Pour in the coffee and add sugar and cream to taste. If you're not worried about calories, top the coffee with whipping cream. A sprinkle of ground nutmeg and cinnamon can be added. This is a great coffee to serve at a brunch. 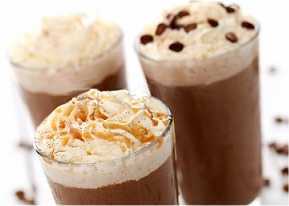 These mixed coffee drinks are best served in glass "cups" or 12 oz. wine glasses - but if you don't have glasses with handles, don't serve in regular glasses - they do get hot! A mug will do. Preheat the glass or mug with hot water. If you pour hot coffee into a glass that is not preheated, it will break. Add the hot coffee with the teaspoon of sugar and stir. Add the alcohol, and top with the whipping cream. Sprinkle lightly with cinnamon. Do not stir. Strong coffee's are best for this recipe. Ask your guests if they want cinnamon before you add it. Some people don't like the spice and it will ruin the taste of the coffee for them. Brew your regular coffee, add the jigger of liqueur. Add some whipping cream if desired and sprinkle with shaved chocolate. Top with a mint sprig. Make sure you start out with your coffee ice cream very cold. If it's too soft, you'll have an iced coffee instead of a milkshake. Spoon the coffee ice cream and coffee into a blender. Blend on high until the mixture is creamy and smooth. Pour into tall glasses, adding a scoop of the vanilla ice cream to each glass. If you're worried about kids—or yourself—and caffeine, you can always substitute decaf and have just as tasty a treat! Coffee everyday - to your health! Coffee connoisseurs smile every time a health benefit is added to all the good reasons to have one more cup. This aromatic beverage, of late, has joined the ranks of powerful, disease-fighting antioxidants. It has also been credited with constituents that are beneficial to heart health, brain function, and more recently, to fighting dementia. Check out the following recipes to make any day a festive one. A research shows, there's no better way to end an evening by toasting to someone's good health -- with a rich cup of java! Kenya Cappuccino - From East Africa, prepare the strong, Kenya ground coffee and mix with hot milk. Top off with whipped cream and sprinkle with cocoa powder. Latté Brazilia - From high altitudes, prepare the mild-brewed Brazil ground coffee. Blend to taste with hot milk and sugar, topped with a sprinkle of cinnamon. 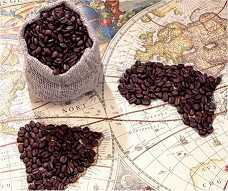 Coffee Kericho - From East Africa, prepare the bold Kenya coffee and top it with a generous helping of hot frothy milk. Latté Ipanema - Hot from the famous beach of Rio, prepare the mellow-brewed Brazil ground coffee and pour into a cup with an equal amount of hot milk. Café Frio - From the mountains of South America, prepare the medium roast Colombia ground coffee and blend with equal parts cold milk. Add ice cubes. Café Helado - For a Spanish ice cream dessert, prepare the medium roast Colombia ground coffee. Put ice cubes, vanilla ice cream and cold milk (optional) into an electric mixer and blend until creamy.